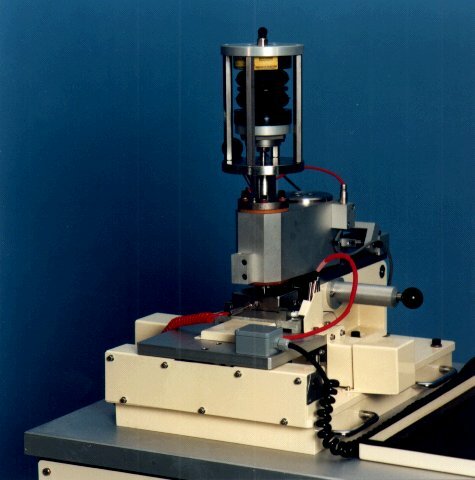 The Microprocessor Controlled Pin on Disc Machine has a Class 1 contact configuration (pin or ball loaded vertically downwards onto a horizontally rotating disc) and accommodates a variety of test geometries. The principle features of the unit are very rigid pin and disc carriers to allow nominally flat-on-flat contact and the use of pneumatic loading on the pin to reduce inertial loading effects in the contact at high loads. This latter feature is an important difference from other pin on disc designs that use dead weights and a load beam. The loading inertia can effect dramatically the friction and wear data obtained. The control unit includes the SLIM 2000 Serial Link Interface Module and COMPEND 2000 Windows based control and data acquisition software. The automatic control of load, speed, temperature and test duration, combined with flexible data logging and alarm level checking, greatly facilitates use of the TE 67 for in-depth parametric studies in the wear of materials as well as more routine screening and development problems. The operating ranges can be extended with options for air heating, a lubricant enclosure, a reciprocating plate adapter, line contact adapter and fixtures for piston-ring/cylinder liner and annulus (thrust washer type) specimens. Test may be run in pin/ball on disc mode according to the guidelines laid out in ASTM G 99, DIN 50324 and ISO/DIS 7148-2 and in reciprocating mode according to ASTM F 732. The machine base frame holds the disc carrier spindle and the pin carrier assembly in a fixed orientation. 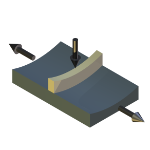 The two assemblies are designed to maintain alignment between the pin and disc specimens so that flat-on-flat geometry can be used. 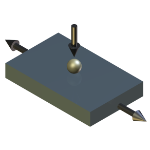 Many test methods will use spherical ended pins or balls. The test disc is mounted on the disc carrier spindle and secured by a central bolt. The spindle is driven through a pulley belt by the vector controlled a.c. motor mounted beneath the machine. The motor has encoder feedback to ensure stable running speeds and a large turn-down ratio. 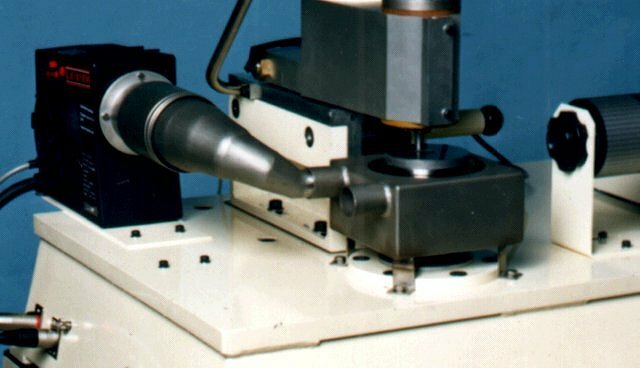 The track radius is set by moving the pin carrier assembly radially, permitting multiple tests to be performed on one disc specimen. 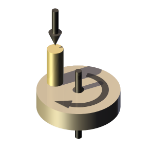 An integral scale is used to set the radius to the middle of the pin/ball specimen. A high-sided ring fits over the disc carrier to permit tests to be run with lubrication at low sliding speeds. TE 67/LE provides a fully sealed system for higher speeds. The pin carrier assembly consists of a massive aluminium block pivoted about a vertical axis through its centre. Interchangeable loading capsules fit into the front of this block. 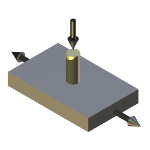 The test pin/ball holder is inserted into a collet clamp that screws into a precision piston in the loading capsule. The load is therefore applied directly above the contact point. The pneumatic capsule has a load range of 25-1,000 N at 7.5 bar operating pressure. An in-line compression load cell measures the applied load and provides load feedback for control. Both steady and fluctuating loads with a sine or triangular waveform can be applied. The dead-weight capsule has a load range of 5-100 N. Load is applied to the pin by adding calibrated masses to the loading pan. The large range obtainable by these interchangeable capsules facilitates parametric studies based on load. The entire pin carrier assembly can be rotated out of its locked horizontal position thus separating the contact and allowing access for changing specimens and examining the surfaces. 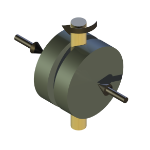 A strain gauge load cell is mounted at the rear of the pin carrier block, preventing the block pivoting about its central axis. This transducer therefore measures the force exerted on the pin during sliding. Two load cells are provided to match the ranges of the loading capsules. A retaining clamp maintains the pin carrier in contact with the transducer at all times, ensuring that bi-directional forces generated in pin on disc and reciprocating contacts are measured. An indication of wear processes going on in the pin/disc contact is given by a linear potentiometer mounted in the pneumatic capsule. This transducer measures the movements of the pin piston during a test which can be due to wear, thermal expansion and wear debris generation. The pin loading capsules are electrically isolated from the carrier block and therefore from the disc specimen. This allows a small potential to be applied across the pin/disc contact from a Lunn-Furey Contact Resistance Circuit. 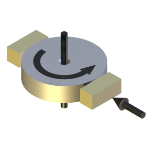 The connection to the disc spindle is via a slip-ring and to the pin by a simple screw connection on the loading piston. The basic machine is provided with a sliding contact thermocouple that rests on the disc surface outside of the contact path. Further temperature sensing is provided with the TE 67/HT package. The TE 67 has PC based sequence programmable control and data acquisition. This is provided by an integrated Serial Link Interface Module and COMPEND 2000 software running on a host PC, operating under Windows. Data is stored to hard disc in standard spread sheet compatible file formats (.csv or .tsv). The TE 67/HT1 comprises a stainless steel enclosure, which surrounds the test specimens and has an inlet and outlet port and a lid with access for the pin specimen and a viewing port. A high power air blower with electrical resistance heating element is used for heating the enclosure, with the hot jet directed into the inlet port of the enclosure and the exhaust directed to a chimney covering the outlet port. For lubricated tests the disc surface is open to the air and the disc carrier is heated by the air heating system only. The temperature is restricted to 200°C and measured with the standard trailing thermocouple. For dry tests the lid is fitted to fully enclose the specimens: both the disc and disc carrier are heated. The air heating system allows temperatures up to 400°C. An optical pyrometer is set to monitor the temperature of the edge of the disc through the viewing port on the lid. This provides the feedback signal for temperature control. Higher test temperatures can be achieved by the addition of TE 67/HT2 gas fired heating system. This consists of a small propane gas torch whose flame is directed through the inlet port of the enclosure to heat the disc carrier. The exhaust is directed to a chimney covering the outlet port. The torch has an integral piezoelectric starter and the system is controlled by means of a pilot flame and solenoid valve on the main gas supply. The maximum temperature with this arrangement is 750°C. The Reciprocating Pin on Plate Adapter fits in place of the disc carrier and heater enclosure. The plate specimen carrier is a complete sub-assembly that mounts over and on top of the drive spindle. The existing pin carrier assembly mounts on top of the Adapter. The fixed plate specimen is located on two screw fittings in a stainless steel reservoir. The reservoir is clamped to a block that is heated by four electrical resistance elements and the temperature is monitored by a thermocouple pressed against the side of the specimen or holder. The reservoir can be moved sideways on the heater block so that multiple tests can be performed on one plate specimen. The heater block is mounted on a small base plate, restrained to move in a horizontal plane by linear bearings. This base plate forms the outer part of a scotch yoke mechanism. 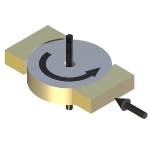 The inner cross head is driven by an eccentric pin mounted on the drive spindle. The eccentricity of this pin can be set between 0 and 25 mm, giving a total stroke of 50 mm. The motion is pure sinusoidal. The reciprocating adapter offers a valuable extension to the operating range of the TE 67. In particular the reciprocating contact offers a more realistic simulation of some practical contact situations (for instance reciprocating seals, piston ring and cylinder liner and other repeating contacts). 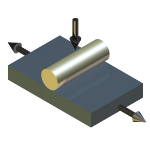 The maximum operational frequency at 50 mm stroke is limited to 5 Hz for reasons of machine vibration. Higher frequencies are permissible provided that the total stroke is reduced. 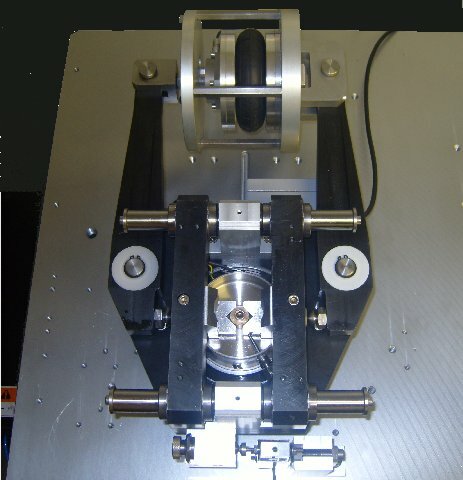 This pneumatically loaded adapter allows tests to be performed using the classic pin on vee block test geometry and also using the twin block on ring geometry, with a test block loaded on either side of a rotating ring. The block specimens may either be flat or conforming, the latter allowing journal bearing type tests to be performed. 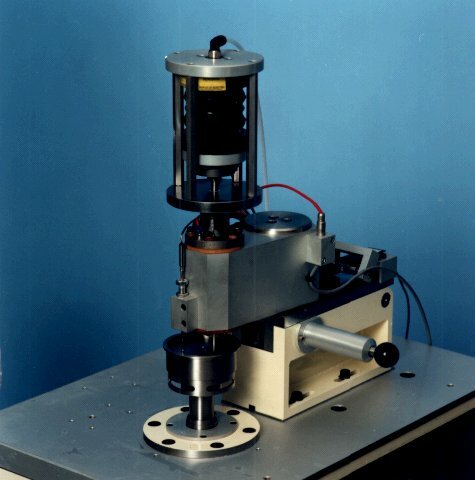 The TE 67/LE is a stainless steel enclosure that mounts over the test spindle. It is sealed against the rotating shaft and provided with a lid to permit tests to be run with the disc fully immersed in fluid. Two electrical resistance heater elements are mounted in the base of the enclosure to allow the fluid temperature to be controlled up to 200°C. Thermocouples are provided to sense the enclosure and fluid temperatures. The fluid may be fed by gravity or circulated through the enclosure using the TE 67/LS or other suitable circulation system. The feed position is on the lid close to the in-running side of the contact and the drain is located at the base of the enclosure. 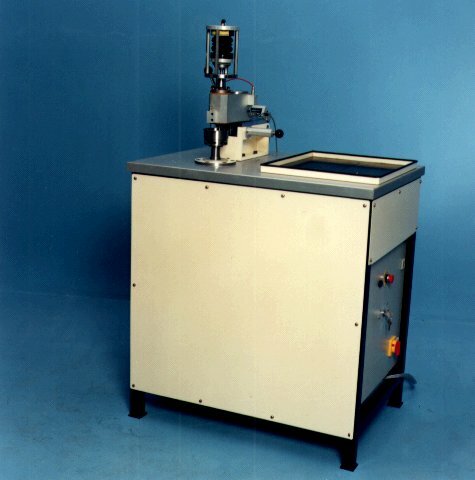 The TE 67/A is a thrust direction test, meaning that two flat faced rings or washers are pressed together. The lower ring is rotated. The pin carrier assembly is set to ZERO radius so that the loading direction is concentric with the disc carrier spindle axis. The upper specimen is located in a spherical bearing: this ensures that the pressure is evenly distributed around the annulus and permits the frictional torque to be measured. A torque arm is attached to the spherical bearing assembly and the standard strain gauge transducer is moved from the rear of the pin carrier assembly to a new mounting position that restrains this arm from rotation. There are two positions for the transducer, giving torque ranges of 100 Nm and 54 Nm. 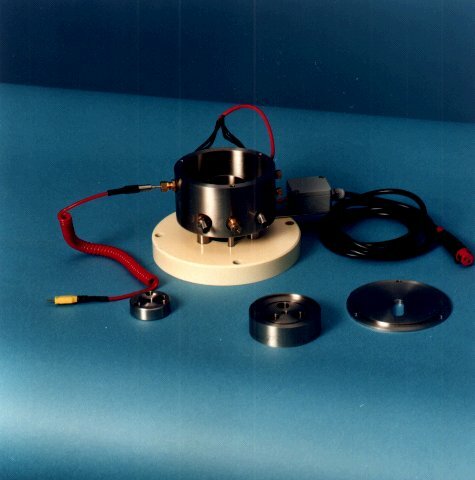 The TE 67/RSTE is a sealed pin on disc test enclosure used in conjunction with the TE 67/HIS Induction Heating System. This combination allows sealed pin on disc tests to be run at temperatures up to 400°C and unsealed tests up to the limit of the heating system but not exceeding 750°C. This comprises a Model TR1-1 kW microprocessor controlled induction heater, standard work head assembly, induction work coil and air blast water cooler. Sample holders for running tests with piston ring and cylinder liner on the TE 67/R Reciprocating Adapter. This incorporates a self-alignment mechanism to ensure face contact is maintained. The two most important parameters to calibrate on the TE 67 are the normal load and the friction force. TE 67/CAL provides a pivoted beam with dead weights able to apply up to 1,000 N to the loading system and a pulley, cord and weights to apply a tangential force to the pin carrier for friction measurement. Tribology Transactions, 37(3), 1994, 656-666. Tribology International, 21(10), 1988, 27-30. Tribology International, 22 (4), 1989, 253-258. Surface Coatings and Technology, 88, 1996, 269-273. SAE 982946 (presented at VII International Mobility Technology Conference, Sao Paulo, November 9-11, 1998). Proc. 7th International Colloquium, Tribology 2000 – Plus, Esslingen, January 2000, Paper 24.8, 1663-1670.